Sober, trenchant exploration of the need for settling the crimes of the Soviet Union with history. The Soviet Union collapsed in 1991, yet a proper reckoning over its 73 years of totalitarianism has not yet been achieved, writes Hudson Institute senior fellow Satter (Darkness at Dawn: The Rise of the Russian Criminal State, 2003, etc.). Reflecting his own visits to Russia, the author looks at various facets of Russian society with an eye on the Soviet past—e.g., national monuments, textbooks, the election of Vladimir Putin and rehabilitation of many of Soviet leaders—and he questions why a moral reflection has not penetrated very deeply. Many Russians look back at the Soviet era as a time of solidity and security, when everyone had jobs and were taken care of by the state, and the Soviet Union was perceived as powerful. The election of Putin has reinforced a dangerous tilt toward nostalgia, as one of his first acts when assuming power in 2000 was to restore a plaque commemorating his former KGB boss, Yuri Andropov, the “cold-blooded” autocrat. Even though the crimes of the Soviet regime eventually became known to the people, the dossiers of KGB informers were swiftly closed by law in 1992, and President Yeltsin’s attempts to ban the Communist Party in 1994 were largely foiled. Putin’s proposal to reintroduce the Soviet national anthem “enabled Russians to be proud of the Soviet-era achievements,” but without the essential moral introspection. 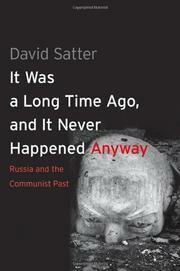 Throughout Satter’s journeys across Russia, he witnessed the struggle between forces of remembrance and forgetting.